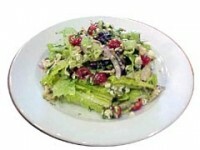 This recipe comes from Heidi Krahling of Insalata’s restaurant in San Anselmo, CA. It is a healthy and tasteful Sunday night supper dish. Add salad ingredients to a large bowl and toss to combine. Mix vinaigrette ingredients together and use to dress salad.